Rated 4 out of 5 stars by 9 PRO members. A very big thank you to anyone having flown my project in FS9. You will find this aircraft totally different and more user friendly. Screenshot of Lockheed SR-71 Blackbird in flight. 0_Images (ref): Four larger images for reference. Effects: copy and past the CONTENTS to the FSX effects folder. DO NOT OVERWRITE any files. Flight Simulator X Files: copy and past the CONTENTS to your Documents folder of the same name. SimObjectsAirplanes: copy the aircraft file within, to your FSX airplanes folder. NOTE: The gauges in this project are in both panel folders. DO NOT TRANSFER them to the FSX Gauges folder. When activating say yes to the run question. There maybe some misalignment with runways in flights that start from an airfield as alignment will depend on what scenery you are using. Be very sure to follow the taxi and takeoff instructions. Whilst this project is based on saved flight plans to replicate the performance given in the email on page 6 of the Manual you can of course follow the flying instructions: takeoff from your favorite airfield, climb to a subsonic 40000ft as instructed, go supersonic and climb to say 84000ft, achieve at least mach 3.2, take a screen grab of the territory below, then turn 180 degrees and find your way back to your airfield and land. You will find that will not be easy without GPS guidance back to your home base as you will probably be 800Nm away when you start your return. The archive z_sr71_81.zip has 211 files and directories contained within it. I’m not really one for the whole weapons of super destruction via the skies thing that we as a race have grown accustomed to, but in terms of their technical prowess and the progress we have made in just a few decades in terms of military aviation I need to pay homage to these projects as much as I can. When using a flight simulator, for example, their ample capability and appetite for destruction bothers me a whole lot less when it’s pixels I’m firing at, not people! This mod, though, has me looking at military aviation in a whole new light. It’s a very awesome project that was brought back from the purgatory that is FS9, and has been re-mastered to fit in with the more demanding yet more rewarding world of FSX, giving you all the help that you need in understanding how to take the whole thing a step further. 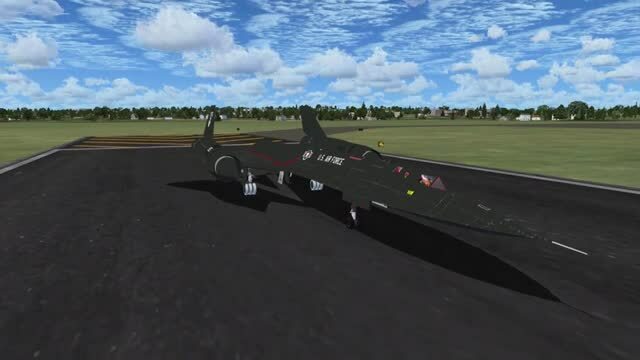 It’s far more user-friendly than it used to be on account of the wealth of new features and limitations that are in place when using FSX over FS9, so you can get a bit more of a taste about what the Blackbird actually is capable of here. It’s attention to detail on the actual model is hugely impressive, and I noticed the difference between the FS9 version and the FSX equivalent more or less within the first sew seconds of starting up the simulator to try it out. It really is night and day, and the performance improvements and attention to detail has really taken hold here as well. This makes it a whole lot easier for you to get into the cockpit and take off, as you know that you are flying something that truly looks and performs like the real thing. Whilst I did notice or two issues with runway alignment, it was nothing that I wasn’t able to correct with a bit more concentration on the takeoff. This can make your life a whole lot easier, and ensure that you are able to take off and look after the aircraft properly at the same time. If you take off awkwardly due to this it’s best to restart as you will no doubt find taking off efficiently tough if you mess up your angles on the way up into the sky, making it a whole lot tougher to land on the way back down. Likewise, this project gives you the ability to hit a barely believable Mach 3.2, which I’d never really been taken to in a simulator before. Give yourself a little challenge by boosting away in a 180 degree angle form the air base in Mach 3.2 and see how long it takes you to get back normally; the difference in speed is absolutely incredible! You will find it easy to do without using a GPS, most likely, which can give you a real challenge! Madness and tricks aside, though, this is a truly accurate recreation of a staggering piece of military hardware. A reverse thrust in fax is f2, reverse thrust when used on landing. SR71 does not have thrust reverse! I would have thought the VC would have been fixed by now. I was wrong. What is the deal with the morris code?! It beeps non-stop. Someone must know how to make it stop. Love the plane, but the incessant beeping has ruined the plane. Absolutely ruined. I also noticed a lack of VC for me as well.